"We do not want lawbreakers to become lawmakers"
Dr. Tahir-ul-Qadri, Januray 16, 2013. A fearless anti-Taliban cleric has drawn more local and international media attention and focus in a few days than a Taliban-sympathizing cricket icon who has been active in Pakistani politics for more than a decade. He has addressed a huge rally in Lahore on December 23, 2012, eclipsing an earlier large rally by PTI chief Imran Khan at Minar-e-Pakistan. He has brought the ruling coalition to its knees by forcing its members to publicly accept his demands for electoral reforms to conduct transparent, free and fair elections in front of tens of millions of Pakistanis who watched it live on almost all of Pakistan's many news channels. Allama Tahir ul Qadri, a Pakistani Islamic scholar best known to the world for his fearless anti-terrorism fatwa, has proclaimed deep in the heart of Pakistani capital Islamabad that "law-breakers must not be allowed to act as law-makers". 1. Most of the Pakistani lawmakers of all parties are in fact law-breakers. 2. Lawbreakers belong in jail, not in parliament. Such lawbreakers are part of the problem, not part of the solution. 3. Over 70% of Pakistani parliament members do not file any tax returns at all. Tax dodgers and lawbreakers can not be allowed to serve in Parliament under Article 62, clause F of the Constitution of Pakistan. Dr. Qadri demanded that there should be "no representation without taxation". 4. Most of the politicians of all stripes in the national parliament and provincial legislatures steal electricity and gas and do not pay their utility bills. The constitution (Article 63 clause R) says that any defaulter of electricity and gas bill of more than Rs. 10,000 over six months can not serve as a member of parliament. Hundreds of members of parliament, including government ministers, have had electricity cut off multiple times for defaulting. 5. Many members of parliament have fake college degrees. 6. Pakistani parliament has failed to enact any anti-terrorism legislation even after the killing of over 45,000 Pakistanis in terrorist attacks since 911. 7. The ruling parties in federal and provincial capitals have failed to make progress on providing basic necessities like electricity, water and gas to the people. Dr. Qadri's detractors have tried to deflect his genuine criticisms of the political class by attacking him personally as a "foreign agent" and "pro-establishment", establishment being a code word for Pakistani military. His supporters, however, have remained peaceful, disciplined, passionate and committed to his cause for political reform. In spite of rain and bitter cold weather, ordinary men, women and children have refused to be intimidated by threats and warnings of violence. They have flocked to the nation's capital to press for political reforms in response to Dr. Qadri's call for Long March to Islamabad and prolonged sit-in in front of Pakistan's parliament. Pakistan needs powerful pressure groups to reform national politics. Dr. Qadri's Minhaj-ul-Quran is the first such group. I hope there will be many more such passionate and eloquent activists and public interest groups to act as watch dogs over the nascent political process which must be reformed and allowed to continue and mature. He chose the right time and was at the right place. The government inching towards its last days could not stop the long march. It was pure timing and nothing else, TUQ was very calculating and knew this shortcoming and exploited it to its core. He was definitely thinking outside the box. He is no politician but played his cards very well. In the coming elections, MQM and PTI will face a lot of criticism from the people for not supporting TuQ. One can say, he elevated himself to Ross Perot / Ralph Nader of Pakistani Politics. Imran: "One can say, he elevated himself to Ross Perot / Ralph Nader of Pakistani Politics." I agree. I think Pakistani politicians, be it Asif Zardari or Nawaz Sharif, should not get a free pass. There's a a dire need for reform to make the ruling politicians in Islamabad and provincial capitals responsive to the needs of the people. What has he done other than making just this f----- speech? Only the hard-core Barelvis are supporting him, and he, like Benazir Bhutto before him, is putting the lives of his f----- idiotic followers on the line for a terroirst attack. The government is not on its knees as you tend to claim. 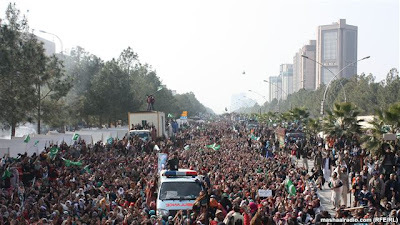 There is little more than a 20,000 person crowd on Jinnah Avenue, given the size of that stretch. While the rest of the idiots are out there in shivering cold and rain, he is sitting in a bullet proof trailer that is heated and well-protected. I have yet to see a Mullah who is not a f----- crook himself. What has this f--- done in his life for the betterment of the people? Shams: "What has he done other than making just this f----- speech?" How many Pakistani mullahs do you know who have issued a fatwa against the Taliban and then led a mach of tens of thousands into the capital of Pakistan? Bullet proof means nothing when you are dealing with bombs and RPGs that Taliban have. It takes a lot of courage to do what TuQ is doing. ^^RH: "Bullet proof means nothing when you are dealing with bombs and RPGs that Taliban have. It takes a lot of courage to do what TuQ is doing"
Every Shia maulana has given a fatwa against terrorism. Additionally, many major Sunni maulanas have spoken very strongly against terrorist acts. Shams: "Every Shia maulana has given a fatwa against terrorism. Additionally, many major Sunni maulanas have spoken very strongly against terrorist acts. " And how many such shia mullahs been killed by the Taliban? And how many such sunni mullahs fled Pakistan after giving such fatwas? And how many of these shia and sunni mullahs who survived have led huge marches into Islamabad after giving such fatwas? I have also been supporting the views of this fellow in last 2-3 weeks and saw him as a ray of light at the end of the tunnel.In fact I was waiting for the news that Imran Khan had joined him as I could see that he had the same agenda as that of Imran Khan. But I was extremely disappointed yesterday when he joined hands with that corrupt lot he was rightly abusing a day earlier.He declared them as the root cause of all problems we are facing and yesterday he announced that he ,together with same lot,will decide who will be the interim prime minister,he will sit with them in his office to discuss about changes in election commission .He will now sit with same "Law Breakers " to make new laws for election commission. "Lawbreakers Again Will Be Lawmakers ." "Hussainiat" signed an agreement with "yazidiat".A tragic end.The D Chowk presented a different Karbala...perhaps the Karbala of Modern age. Salman: "Hussainiat" signed an agreement with "yazidiat".A tragic end.The D Chowk presented a different Karbala...perhaps the Karbala of Modern age. I see the result very differently. It not "Husainiat" that went to "Yazidiat" to compromise. It was the other way around. "Yazidiat" stood meekly in the container on D-Chowk essentially surrendered to the demands of "Husainiat" in front of millions of people watching it live on television. And the leader of "Husainiat" will hold the feet of "Yazidiat" to fire ensure that the "Islamabad Declaration" is implemented. I see it as a beginning, not a end. Hope to see more "Husainiat" groups stand up and fight to make the political class more transparent and responsive to the needs of the people. A couple had just purchased a new house and were moving into it. Suddenly - a large ferocious man appeared in the house and said " I am the genie of this house and I will only allow those who satisfy my demands to move into this house". The couple were frightened and inquired about his demands. He said "Only the woman can satisfy my demands." The couple debated about this for a while and then they agreed to demands and the husband went out of the house for a little while. When the man had satisfied himself he left the house. Before leaving, he turned to the woman and said "Please ask your husband to grow up. He still believes in genies." I am waiting to hear similar remarks from TuQ before he leaves for Toronto. People need to adjust their mental age to their physical age (60+) and stop believing in miracles. TuQ has a very good message. I may enjoy the qawalli. But I will not be one who will be kissing his feet - (for those who saw the video). Rashid: "A couple had just purchased a new house and were moving into it. I'd change the story to make it closer to reality by adding that the couple buying the house had forged papers and stole the money to pay for the house which made them very vulnerable to attacks. One of the officials investigating a corruption case in Pakistan linked to Prime Minister Raja Pervez Ashraf has been found dead. Reports say the man, Kamran Faisal, was found hanged in the government hostel in Islamabad where he lived with colleagues. The Supreme Court ordered the arrest of Mr Ashraf on Tuesday over allegations he accepted bribes when approving power generation projects as minister for water and power in 2010. Police said it appeared that Mr Kamran had killed himself, but that a post mortem examination would be carried out. "We are investigating from different angles... We will establish an opinion after the autopsy," said Islamabad police chief Bani Amin. Mr Faisal worked for Pakistan's anti-corruption watchdog, the National Accountability Bureau (NAB). One of his associates told the BBC the official had been under considerable stress in recent weeks. He had played a major role in the Ashraf case until he and another officer were taken off it earlier this month by senior NAB officials, the man told the BBC. A neighbour also said that Mr Faisal had requested a transfer from the high-profile case and had been very depressed. The death of Mr Faisal is the latest twist in the long-running corruption case against Mr Ashraf, says the BBC's Shahzeb Jillani in Islamabad. It comes days after the order to arrest Mr Ashraf, which came as a populist cleric led thousands of protesters in a march and sit-in in Islamabad. Tahirul Qadri and his supporters were demanding that the government resign ahead of elections due in May. ^^Imran: "One can say, he elevated himself to Ross Perot / Ralph Nader of Pakistani Politics"
^^Shams: "I have yet to see a Mullah who is not a f----- crook himself"
^^Salman: "Hussainiat signed an agreement with Yazidiat.A tragic end." ^^Rashid: "People need to adjust their mental age to their physical age (60+) and stop believing in miracles"
He says one thing in Urdu to Pakistani audience, and then says EXACTLY THE OPPOSITE in English to a Canadian audience. This man is clearly a two-faced liar who will say different things to different people to GET WHAT HE PERSONALLY WANTS. So now he is talking of democracy & accountability to the masses at the rally. But what is he really talking about to the "lawbreakers" behind closed doors? Is it not possible that he has made a shady deal to share the loot with them? Once a liar, always a liar. The basic character of the person does not change. TuQ is a fricking fake. I have to agree with Shams and Salman here. see that guy is another snake oil salesman? see that guy is another snake oil salesman?" Cynicism is toxic. It's the last thing Pakistan needs now. Pakistan doesn't need saviors; Pakistan needs political reforms which can only happen if passionate and committed pressure groups with eloquent leaders push for it. Dr. Qadri's Minhaj-ul-Quran represents one such pressure group. Hope there will be many more in the future. I kind of liked Molana Sb. when he gave that Fatwa. However, I am not sure if he has the right to do what he is doing right now. First of all he has a small following, remember he contested on 200 seats in the elections of 2003 but won only one seat. Second, he is a Canadian now, so can’t even contest in Pakistani elections. Third, just because you have a following of some people does not mean you can dictate your views on the elected parliament and officials of the state. As Asma Jahangir said, what stops someone else from gathering 50,000 people tomorrow and asking that their demands be accepted and day after someone with 100,000 people to accept their demands. Is Qadri not making a CLEAR case for bringing back Army Rule? Is that his real agenda? Is he working with his backers to set the stage for a new Army coup? Think about it: Has he ever issued any fatwas against Army coups? Has he ever lead any marches against Army rule? Was he not comfortably co-operating with Zia and Musharraf during their martial-law reigns? Was he not full of praise for the Army/SC just before this march began? Has he ever criticized the Army/ISI for constantly interfering in politics, disrupting elections and not allowing democratic institutions to form over the last 60 years? ^^RH: "Cynicism is toxic. It's the last thing Pakistan needs now." There is a difference between Healthy Cynicism and Unhealthy Cynicism. On the far-left, it is harmful to be too gullible and naive (Overly Optimistic). On the far-right, it is counter-productive to be too cynical and suspicious(Overly Pessimistic). Somewhere in between the two extreme lies the wisdom of the balanced mean of REALISM. Zamir: " First of all he has a small following, remember he contested on 200 seats in the elections of 2003 but won only one seat." History tells us that it's always small bands of vocal, passionate and highly committed people who have brought about reforms in any society. Every democracy has to have such pressure groups to watch the self-serving power elite, elected or otherwise, and force them to be responsive to the interests of the people at large. ^^RH: "History tells us that it's always small bands of vocal, passionate and highly committed people who have brought about reforms in any society"
Highly Committed. Intensely Passionate. Leading the "MASSES". Which of the above are you refering to? Note again that our own Quaid-e-Azam did not believe in passionate committed mobs. He believed in legal, constitutional methods. He was a lawyer who belived in rule of law. He argued that we should all follow the existing laws until we have managed to change them through legal, constitutional means. He dismissed mass-mobilization and crowd-gatherings as "rabble rousing". That is why Jinnah's name is not on the list above. "Why Maulana Qadri and Cricketer Khan can’t save Pakistan"
This man freely lies all over the place and yet some think of him as the "Savior" of Pakistan. So what stops TTP from gather a few thousand (or maybe few hundred thousand) people in Islamabad and demand that the constitution be band and their form of Sharia be enforced? Once we start going this path, it becomes slippery slope. Zamir: "So what stops TTP from gather a few thousand (or maybe few hundred thousand) people in Islamabad and demand that the constitution be band and their form of Sharia be enforced? Once we start going this path, it becomes slippery slope." No one was able to do in such a peaceful, organized, and committed fashion as Dr. Qadri has. He lived up to his promise that 'aik bulb naho totai ga. aik gamla nahin totai ga" (Not even a bulb nor flower pot will be broken). And none of his demands that were made and accepted were extra-constitutional. Such protests by various pressure groups are normal in democracies. People do it often in Washington and London to have their voices heard. The best example of it was the civil rights march at the Washington National Mall by Rev Martin Luther King in 1960s. I hope that Pak politicians and Islamabad will get used to it over time. Speaking at a press conference in Islamabad, Khan said that he had kept his party members on standby for the protest, which is why, he said, he had earlier announced a 7-point agenda. “Being a political party, we hold the right to lodge protests. About two million people in the United Kingdom took to the streets in order to protest the Iraq killings,” said Khan. He said that there was a lot of pressure on him from his party members to join Minhajul Quran International chief Qadri’s long march, however, he said that he told his followers to wait for the “right time”. While talking about a caretaker setup to be put in place, Khan said that all political parties should sit together to deliberate upon the issue and that the caretaker prime minister should be the one agreed upon by all the parties. However, he said that so far, no one had approached his party to discuss the caretaker setup. Imran Khan said to Qadri, "my wee-wee is bigger than your wee-wee". Altaf Hussain jumps into the fray and promises to hold "biggest ever" protest by MQM women's cadre, which will "trump all other women's rights protests people have seen in the past anywhere in the world". Soon we will hear the term "mother of all protests" on GeoTV. Pakistan will then become the global epicenter of all meaningless protests. All meaningful economic activity will be disrupted. The already-staggering economy will then simply COLLAPSE. And this collapse will lead to even more protests. People will beging to protest against all these protests. And there will be a rash of mindless suicide bombings. This is a nightmare for Pakistan. Let us assume that Pakistani parliament has enacted STRONG "anti-terrorism legislation in response to the killing of over 45,000 Pakistanis in terrorist attacks since 9/11". Let us further say that PPP-MQM-ANP-PML have built "a broad national political consensus for decisive military action in FATA from where the Taliban terrorists and their sectarian allies get support and training to carry out devastating terrorist attacks against innocent civilians throughout Pakistan". If the GOP orders the Army to take on the Taliban in FATA and the Army REFUSES, what will GOP do? What can GOP do? The Army does not take orders from civilians. The GOP, even after consensus, can only request the Army to "think about whether they want to" attack the Taliban in FATA. This is the first problem. Next, let us assume that the Army decides to attack the Taliban in FATA. What happened the last time the Army launched a similar operation? The casualties sky-rocketed to 14,000 and thousands of innocent villagers were tortured and killed on video by both sides. This was followed by a rash of massive suicide bombings and retaliatory attacks all over Pakistan, including Lahore, Pindi & Islamabad. Why should it will be different this time? Is Pakistan prepared to take 20,000 casualities per year for 2 years at least in such a conflict? Is Pakistan willing to take daily suicide bombings of dargahs, bazaars, police stations, cantonments, malls, cinemas, petrol stations et cetera? It appears that "political consensus" and "army willingness" are only the beginning. The real question is whether Pakistani society has the fortitude for such a violent confrontation. In addition, there is the question of what will happen to our tottering economy in the face of such a horrific escalation of violence all across the country. Will it lead to capital-flight? Will the PKR collapse? Will the IMF bail us out again and again during this conflict? Will the West pour money into our bowl? What are your views on this? Would a direct confrontation with the Taliban be worth all these consequences? Or would it be better to give them what they want and end the conflict in order to save Pakistan? HWJ: "If the GOP orders the Army to take on the Taliban in FATA and the Army REFUSES"
That's just nonsense! Army has acted against militants many times and will do so again if there's national consensus...at least consensus between PPP and PML (N) at a minimum as was the case for Swat operation in 2009 that brought peace back to Swat allowing businesses and schools, particularly girls schools, to operate again. HWJ: "Is Pakistan prepared to take 20,000 casualities per year for 2 years at least in such a conflict?" These are highly exaggerated figures not borne out by data in any year since 911. Even Indians pay more taxes as percentage of taxes-despite all the tax evasion. It is pathetic, Pakistan is only a smidgen better than Afghanistan!... Meanwhile the politicos are casting aspersion on Qadri. As far as reforms go, PPP has done wonders on this front in last five years..Provincial autonomy has been settled amicably. 73 constitution is back in full strength, The thorny issue of 52 B loved by dicttaors ditched by Zardaari. All power given to PM as per constitutions. Institutions have realised their rights and powers and are working properly.. Military is being sidelined as should be the case in a democrcay. Even military generasl being questioned on some charges of misappropriations. Women rights bill passed and more on the pipelines for the betterment and support of women and minority. Children Rights act promulgated. NFC issues settled, Govt tranparency laws approved, Human rights being respected more than ever, media is free, Judiciary doing its work and what not..It is not about reforms anymore, major reforms are done... It is all about continuation of democratiic process and change in tribal mentality of pakistanis to respect the mandate of the people and let the elected representative given free hand to help to help and improve the lives of their constituents..Pressure groups like PTI and the aprt of solution.. Qadri Like Thugs should be snet home where they can make money fooling people publishing senseless Books about 7th century idiots from Arab land which has never the light of freedom and respect of human life..Even the arab sping is being hickaed by Mullahs over there.. They will need another years to knwo the evil of their religion and come out of its trans..
Sheedi: "As far as reforms go, PPP has done wonders on this front in last five years..Provincial autonomy has been settled amicably. 73 constitution is back in full strength, The thorny issue of 52 B loved by dicttaors ditched by Zardaari. All power given to PM as per constitutions...."
PPP, PML (N), and the rest of the political class who talk about defending the constitution and democracy are full of MNAs and MPAs who are in clear violation of articles 62 and 63 of the constitution. 70% of them file no tax returns. Many have fake degrees. Most steal electricity and gas. Unless the EC acts, these same characters who are not even qualified to be candidates will be re-elected yet again. WE now have free JUdiciary.. Anyone can go to court to disqualify any MNA and MPA.. REcently many have been disqualified.. You can not convict people without trial.. If they don't pay taxes Govt or CBR can sue them and call for audit.. The laws of Pakistran currently do not have Tax on agricultural income.. Let us change that through pressure groups..Qadri does not poay a penny. he is not qualified to talk about it.. That is the only way..Unless you prpve someone has violated section 62 and 63 they can be banned for election...WE have independent ECP now agreed by all parties.. They could be approached if anyone has violated the law..The procedure and courts are there and we can get the results... WE have sent on PM home, and another under trial. There is no excuse to derail democracy after so many sacrifices.. The world will not allow it and Pakistan will be alone once again.. That is very dangerous and unacceptabel to all institutions..
Sheedi: "WE now have free JUdiciary.. Anyone can go to court to disqualify any MNA and MPA.. REcently many have been disqualified.. You can not convict people without trial.. If they don't pay taxes Govt or CBR can sue them and call for audit." It's not a few individuals from just one or two parties....the parliament is full of them. The time to keep defaulters and violators and thieves out of parliament is NOW...before the next election. It's easy to get the records of utility dues defaulters. The EC needs to disqualify them NOW rather than allow the selective suo moto farce to continue for the next 5 years. ^^RH: "It's not a few individuals from just one or two parties....the parliament is full of them. The time to keep defaulters and violators and thieves out of parliament is NOW...before the next election. It's easy to get the records of utility dues defaulters. The EC needs to disqualify them NOW rather than allow the selective suo moto farce to continue for the next 5 years"
If these Members of Parliament are so BAD, then why do the people vote for them? Are you saying that the elections were not free? Were the voters threatened or intimidated into voting for these BAD people? Isn't the whole purpose of VOTING and ELECTIONS to allow the people a chance to kick out the bad guys? So why not let the people decide who is good and who is bad? Let the people kick out these rotten members of parliament in the elections. Why do we need courts or the bureaucracy to do this? Why can't the people do it themselves? HWJ: "Why do we need courts or the bureaucracy to do this? Why can't the people do it themselves?" Going by your logic, why do we need a constitution? Why don't we dispense with it too? KARACHI - Among other factors, the political activity near the looming general elections in the country is calling the shots when it comes to Karachi Stock Exchange (KSE). Last Thursday witnessed the KSE climbing to a new high with the benchmark KSE-100 share index peaking beyond 17,000 points level. The market observers attributed the historic positive to the politico-economic factors developing on the country’s internal and external fronts. The KSE 100-share index gained 148 points to close at 17,056.36 points compared to Wednesday’s 16,908.67 points. The intraday high and low the index hit on the day were recorded at 17,067.58 and 16,908.67 respectively, the closing point of the previous day. Of the total 353 scrips traded, 205 gained, 123 lost and 25 saw no change in their price. The trading volumes were higher to climb to 271 million shares as against 218 million of the previous session. The trading value also rose to Rs 6.90 billion from Rs 5.49 billion on Wednesday. The market capital grew beyond Rs 4.263 trillion compared to Rs 4.22 trillion a day earlier. The free float KSE-30 index also set in the green zone and gained 125 points to last at 13,931.66 points against 13,806.38 points of the previous trading session. The day marked mostly the second and third tier stocks leading the volumes with Fauji Cement, the volume leader, counting its traded shares as 60.334 million, gaining Re 32 paisas on each of its stakes that were priced at Rs 7.48 in the opening and Rs 7.80 at closing. Turnover on the future market also headed northward to stand at 22.983 million shares compared to Wednesday’s 22.172 million. According to stocks analysts, the result announcement session had led other positives to help the index peak to the historic high. Muhammad Sohail, a broker and senior analyst at the KSE, said the announcement of “good” corporate results was the leading attributable factor for Thursday’s stocks market boost. “Good corporate results, foreign buying and a relative calm on local political front helped the equities to cross the 17000 mark,” Sohail, the Chief Executive Officer of Topline Securities, told Pakistan Today. Another equity analyst Ashen Mehanti, a director at Arif Habib Securities, said the rate-cut by the central bank in its Wednesday’s T-bill auction had coupled with the favorable announcement factor. “Stocks closed at record high amid rising trades in the earnings announcements session at KSE after the SBP slashes yield on T-bills,” the analyst said. Other catalysts Mehanti cited were the investors’ hope for a possible cut in the SBP discount rate to be announced next month, rising local cement prices, easing political uncertainty and renewed foreign interest. The abovementioned factors, the analyst said “played a catalyst role in bullish close in stocks across the board at KSE ahead of major earning announcements due next week”. Please give this the publicity due. Is this Qadri going to bring in the "PARADIGM SHIFT" that we so desperately need in Pakistan? I don't think PPP can bring in any change. Neither can PML. PTI does not stand a chance. MQM is mainly a Karachi party. JeI gets too few seats. So, APART FROM OUR ARMY, who is left who can bring in the "paradign shift"? QUOTE: "If Pakistan is to make use of the opportunities implicit in demographic change, a paradigm shift needs to occur in thinking about economic growth and resource allocation. Failure to do so can convert the potential demographic dividend into a demographic DISASTER"
ISLAMABAD: The Election Commission of Pakistan has made it mandatory for candidates for national and provincial assembly seats to submit income and agriculture tax returns of the past three years. According to changes in declaration and oath approved by the ECP at a meeting presided over by Chief Election Commissioner Justice (retd) Fakhruddin G. Ebrahim here on Tuesday, candidates will be required to disclose their income and source and income tax paid over the past three years. They will also have to submit details of their children studying abroad and expenses incurred on their education, foreign trips undertaken by them during the period and cost incurred and a copy of the passport used. The candidates will be required to give details of agricultural land held by them and agriculture income and tax paid during that period. Earlier they were required to provide details of their movable and immovable property in and outside Pakistan, but now they will also have to state location, description, built-up area and market value of the house or apartment in which they are living. The candidates will also have to submit names of their spouse and dependants and declare that the names are correct and no name has been left out. They will be required to give details of companies owned by them, their spouse or dependants. They will also have to submit a statement on oath that they have neither ceased to be a citizen of Pakistan nor they have acquired or applied for citizenship of a foreign state and a declaration that they will have no objection if information relating to acquisition of citizenship of a foreign state or application for such citizenship is provided by a foreign state to the ministry of foreign affairs. Failure to provide details about any matter mentioned in the form shall render their nomination invalid. Those who have been members of the national or a provincial assembly will be required to describe what they consider to be the most important contribution made by them for the benefit of their constituency. Candidates will also be required to state whether they made any payment to their political party to obtain its ticket, and if so how much. They will also have to disclose if they received any amount of money from the party which awarded them the ticket. They will be required to provide details of any donation given by them to any recognised charitable organisation or educational institution over the past three years. Candidates will also be required to provide details of the bank account opened for election expenses, along with the name and branch of the bank and an undertaking that they will make all election expenses from the amount deposited in the account and will not make any transaction for poll expenses through another account. They will have to provide details of the value of total assets and expenditure including mortgages secured on property or land and their personal expenditure, indicating increase or decrease over the previous year. An official of the ECP told Dawn that rules needed to be amended for making changes in the format of nomination papers and declarations, which the commission would be able to do with the approval by the president. He said a reference for the purpose was being sent to the president through the ministry of law and justice. He said the commission had taken notice of reports about Sindh government’s plan to give 27,500 plots to PPP workers and sought a report from the chief secretary. The ECP decided that a ban on transfer of Rs250 million by the Finance Division to the ministry of law for payments to be made to the bar councils will be lifted next month after expiry of the term of the National Assembly. Tahir ul Qadri's Questions: Why is Musharraf the only one disqualified to run for elections? Why not the sectarian terrorists, tax dodgers, loan defaulters, electricity thieves, fake degree holders?